To make an appointment, email Neander at kneander@duke.edu. 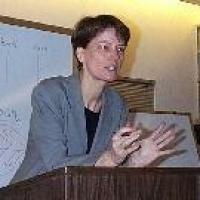 Karen Neander (Ph.D. 1983, La Trobe University) joined the Duke faculty in 2006. Previously she was at the University of California, Davis, Johns Hopkins University and the Australian National University. “Pictorial Representation: A Matter of Resemblance” in the British Journal of Aesthetics, Vol. 27, No. 3, Summer 1987, pp. 213-226. “Functions as Selected Effects: The Conceptual Analysts Defence” in Philosophy of Science, Vol. 58, No. 2, June 1991, pp. 169-184. Reprinted in Nature’s Purpose: analyses of function and design in biology, ed., by Colin Allen, Marc Becoff, and George Lauder, MIT Press (1997). “The Teleological Notion of ‘Function’” in The Australasian Journal of Philosophy, Vol. 69, No. 4, December 1991, pp. 454-468. Reprinted in Function, Selection, and Design (The State University of New York Press) ed., by David Buller (1998). “Misrepresenting and Malfunctioning” in Philosophical Studies, Vol. 79, No. 2, August 1995, pp. 109-141. Excerpted in Function, Selection, and Design (The State University of New York Press) ed., by David Buller (1998). “Pruning the Tree of Life” in British Journal for the Philosophy of Science, Vol. 46, pp. 59-80, March 1995. “Swampman Meets Swampcow” in Mind & Language, Vol. 11, No. 1, March 1996, pp. 118-129. “The Division of Phenomenal Labor: A Problem for Representational Theories of Consciousness” in Philosophical Perspectives, 12: Language, Mind and Ontology, A Supplement to NOUS, edited by James E. Tomberlin (Blackwells, 1998), pp. 411-434. “Fitness and the Fate of Unicorns” in Biology Meets Psychology: Philosophical Essays, edited by Valerie Hardcastle (Bradford, MIT Press; Cambridge, Mass: 1999) 3-26. “Types of Traits: The Importance of Functional Homologues” in Functions: New Readings in the Philosophy of Psychology and Biology, edited by Andre Ariew, Robert Cummins and Mark Perlman (Oxford University Press, 2002). “Content for Cognitive Science” in Teleosemantics, edited by David Papineau and Gary McDonald (2005, Oxford University Press). Neander, K. "Biological Functions." Routledge Encyclopedia of Philosophy. 2013.